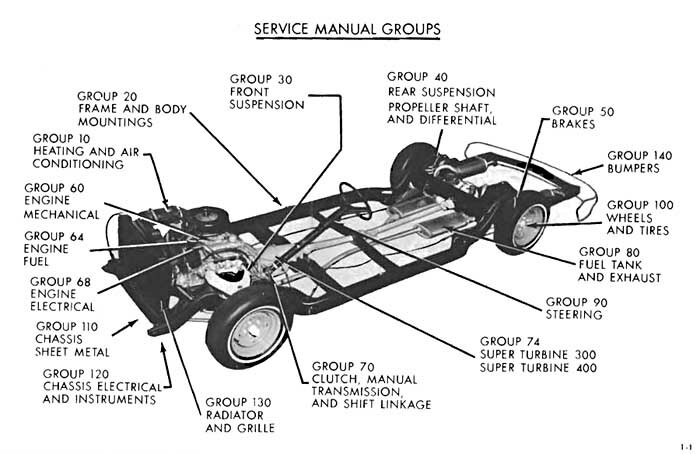 The 1966 Buick Chassis Service Manual has been reorganized to correspond more closely with current servicing techniques. The various chassis components and systems have been classified into the sixteen major areas listed on the previous page. Each area corresponds to a GROUP with the exception of the 6th and 7th areas which are comprised of more than one GROUP. Every GROUP contains one or more SECTIONS. Each SECTION deals with a specific version of a component or system. 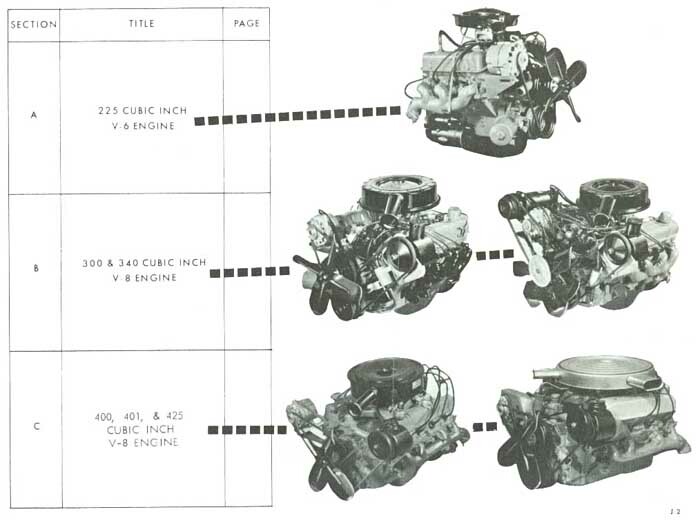 For instance, since there are major differences between the 225 cubic inch V-6 and the 401 cubiC inch V-8, each engine will be treated in separate SECTIONS of GROUP 60. A DIVISION contains one or more PARAGRAPHS which can be identified by the series of numbers preceeding them. The PARAGRAPH number consists of the GROUP number, a hyphen, and a sequence number; paragraph arrangement is numerical. SUB-PARAGRAPHS are used when necessary for clarity or to provide distinction between models. SUB-PARAGRAPHS are designated by a letter and are in alphabetical order. To locate any desired information, locate the proper GROUP listed on the front page of the manual. Bend the manual until the black tab on the first page of the GROUP can be seen in line with the GROUP title on the front page. The first page of the GROUP lists the SECTIONS contained therein. Turn to the proper SECTION, locate the desired DIVISION, and note the page number of the PARAGRAPH containing the information you are seeking.